Daily Illuminator: Visit SJ Games At Origins June 13-17! 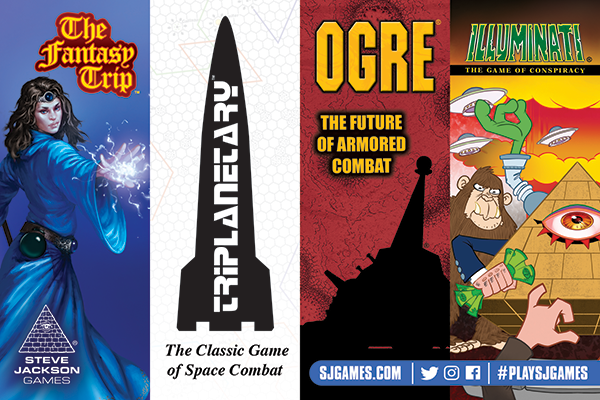 June 12, 2018: Visit SJ Games At Origins June 13-17! We're getting pumped for one of the biggest shows of the year – Origins Game Fair! The convention runs June 13-17, and we're spending every day of that gaming with fans. We're making our triumphant return to the show in style, with a host of new and upcoming games, and even the ability to play games with Steve Jackson himself! SJ Games will be taking over room C150 at the show, and we're packing it with all sorts of gaming goodness. Munchkin Collectible Card Game: We're running how-to-play events and events featuring the new set, The Desolation of Blarg! You can also compete in our Regional tournament for big prizes and exclusive loot! Ogre: Steve has a few events planned, including a massive 12-person Ogre game! We'll also have samples of our upcoming Ogre Miniatures releases previewed in the case. If you're looking to buy, our retail partners at Adventure Retail will have Ogre Miniatures Set 1, Ogre Sixth Edition, and Ogre Reinforcements as well. The Fantasy Trip: If you haven't heard, our biggest upcoming release is The Fantasy Trip, and we're excited to finally be able to show fans the game at Origins! We're bringing back the classic, Steve's first published RPG, and he'll even be running demos at our room. Swing by to sneak a peek, and sate your appetite in the meantime with a look at some of the old-school inspired art that we've previewed! Triplanetary: With the game shipping soon to backers, and a limited amount of preorders open now, we won't be selling it at the convention. However, you can get in a demo game at Origins and see why this classic remains one of Steve's favorite games, and why he worked so hard to bring it back. Not only that, but Adventure Retail will have all the newest selections of SJ Games available, like Munchkin Cheats and The Desolation of Blarg. And that's just the beginning! Make sure you sign up for your events on the Origins site: simply log in to your account and find the events you want to play in! We're ready to rock and roll all weekend, so come by, say hi, and play a game with us!